b. I am something of an expert on myself. He told me that I need to set some goals for my recovery/rehab since one can expect improvement up to 9 months to a year. I am not sure whether he was giving me a 3 month extension or says this to everyone but I’m going with it. Three months to get back to as good as I’m going to get. And, as Stephanie says, “I’m not a quitter.” So, diligence is the name of the game from now until April the 26th. But, I have no more appointments with the doctor. I am on my own. His job is done. What must we do to come? Should we just venture forth trusting God will send someone looking if we get lost? who holds our hand so we won’t fall. In whose presence there is always light to see the way. I’m going to have to make a rule: You may only go for a walk or run AFTER you do your strengthening exercises. The home gym, inexpensive but effective if you use it. When I was going to PT two or three times per week, my progress was insured. When I went, I did my exercises, all two hours of them. But now that I’m down to one PT a week, I’m supposed to continue with my strengthening at home. Oh, I have the equipment, just not the motivation. 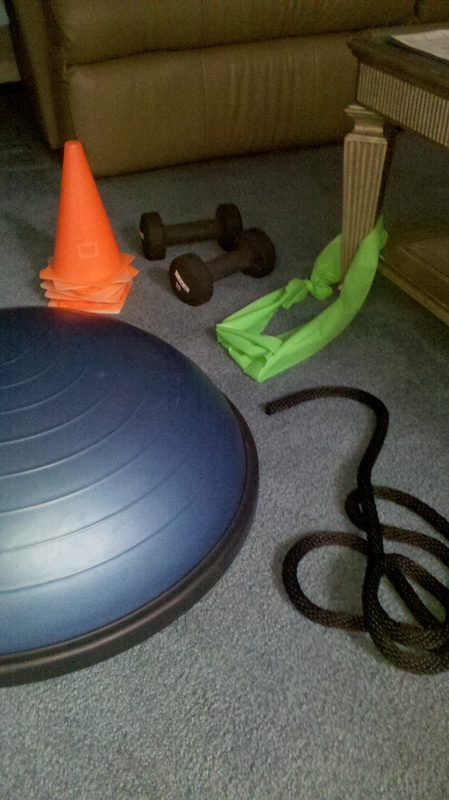 Who wants to do band exercises in 4 directions and 2 rotations on each leg when it’s 80 degrees and sunny outside? The problem is: when I get a bit slack and hit the roads for some fun, my knees and hips complain afterwards. They can’t run smoothly when they’re not strong. And they’re not strong enough yet. I haven’t put in the work required. So, today, new rule: boring exercises first, then I may run, if there’s time. And let’s not forget the stretches. Strong or not, I won’t be running long without those! I finally was allowed to run just a bit at physical therapy on Tuesday. Five months since my surgery. 5 and a 1/2 since my injury. Yeah, only a minute here and there, alternated with walking. Only at about 11 minute mile pace. But hey, I’m running, right? 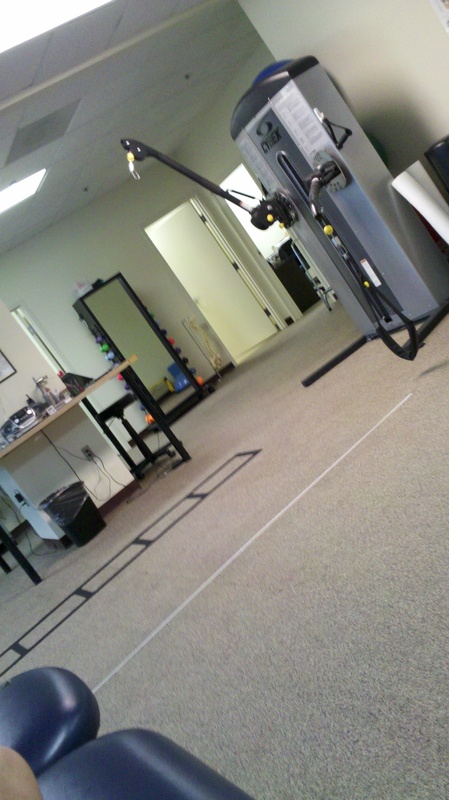 This is what Physical Therapy looks like from lying on the treatment table. A couple of weeks ago I had a set back. I was on the floor a-straddle a carpet runner that Scot and I were attaching adhesive backing to. I reached forward to pull the adhesive and heard/felt something give in the hip. Not a tearing or ripping. Just an ‘ugh-that-wasn’t-good’ kind of feeling. I was a bit more careful after that. But inevitably that means I’ll ache and be sore the next day. And I won’t be able to do what I was doing in PT. (hopping, jumping, lunges) Because now, the support system for the hamstring is licking its wounds. I lament not knowing when I first got in the brace how I could sit to prevent some of this hip atrophy. But back then I was just worrying about surviving. There really was no strategy to it. Hindsight is always 20-20, eh? All in all, I’m not well yet. But I am nearing the time when I have to stop taking it easy on myself and just get this show on the road. The key is pushing myself to do a little bit of what my muscle is reluctant to do without hurting it. Pushing without pulling, one might say. Controlled overload. The physical version of aversion therapy. (Expose yourself bit by bit to what you fear until you lose your fear.) Then, tolerate the soreness, trust the process and gradually move forward. They told me this would take 9 months. I guess all of human creation takes 9 months of gestation. I’m working on embracing it as a time to evaluate, organize, research and plan. To take a good look at what’s next for me. This is the off-season, a time before spring training starts, before there is pressure to compete. Just to grow the idea and become its mother. We know who the Father is. Giving thanks for healing, for PT guidance and companionship, for Facebook friends’ encouragement, for my family’s patience and, ironically, for time. So often it’s the foe. What am I in a hurry to get to? If I rush, I won’t be able to claim it when I get there. If I don’t prepare now, I won’t be able to embrace the opportunity that surely awaits there. Wishing it was easier. Wishing I was more diligent. Wishing there was more obvious progress. But I think there is something good on the other side. My turn now is to do what’s before me (thanks Diane J. for those words) and not worry about what’s around the bend. It’s a time of preparation. Ironically and God-incidentally, as I close, I came across this from Billy Graham. You can click here to read the whole article. Second, time is a test. Time in itself is neither good nor bad except as we make it so. But it becomes a crucial test, sifting us through and through, minute by minute. As life goes on, there are billions of events happening in every moment of historic time. To those billions of events we contribute our quotas. What is the next contribution that you will make? In the next instant you can tell a lie or commit other sins, or you can choose to use that time to serve God and to lay up treasures for eternity. Third, time is an appointment. Thus time is an appointment with Christ, and the Bible says, “Now is the accepted time” (2 Corinthians 6:2, NKJV). God has given us a moment in which we can come to know His Son Jesus Christ. We can come out of time and enter eternity with Him. From now on, everything we do can be done with eternity in view. I think I am in the cabinet phase. You know. When you pour the foundation, frame the house, put in the windows -when you get it under roof – this all goes quickly. “Wow, look how fast that house went up!” we say. But no one moves into that house for quite a while because the specialists all have to come. First, there are the detail guys who run the wiring and put in the plumbing. Then comes the painstaking detail, trim work, chair molding, light fixtures, bathroom fixtures, and painting. These craftsmen give the house character and personality. That’s the phase I’m in: the character phase, orchestrated by the cabinet-maker. They say Jesus was a carpenter, but I think of him more as a cabinet maker. Not one to saw the boards for general construction, really, but more of a detail man. I can imagine him making sure the door hangs true and the hinges fit snuggly so the cabinet operates as it should. Yep. I’m in the cabinet phase now. Working on getting that hinge to work as it should. Glad I know a good Carpenter. I am not being chauvinistic here but the young woman who set up our beach umbrella today didn’t do such a good job. The wind pulled it right out of the ground, tumbled it upon my four sun-bathing girls and onto a couple sitting in front of us. I jump up and out of my sand chair, cell phone in hand, to grab the umbrella. I extract it from our gracious neighbors and realize, as the wind is whipping it in my hand, that I have no idea what I will now do with it. “Here, hold the phone,” I tell Olivia. Sasha grabs the umbrella from me. “I’ll go get help,” I tell her. At once, I am racing across the soft sand. Fifty yards up the beach is the able-bodied young man who works the umbrella stand. My feet dig through and my arms pump. Hurry. The sand is hot. Is it EVER hot! But I am not thinking about the hot sand. Something feels odd…oddly strong. It’s the sensation of running. I am running. Evenly. Strongly. Without thought. I am not supposed to run. Haven’t been released to run yet. I slow. Nope. Sand is… Ouch…hot. I dash again. Now, I’m being a little bit bad but since I can take little quick steps and side to side steps and since I can dash across the sand in an emergency, I am planning to sprinkle a few jogging steps into my long walk this morning. The route brings back so many memories of beach trips gone by. When I left at sunrise each morning and jogged along Route 1 out to the water tower and beyond. Today I am again that person. The jog-walker. Not limited to mere slow, ambling strides, I can step freely. I test a few paces wondering how far I can stride. If it hurts, I will reduce it to walking. But it doesn’t hurt – not when I stride, not when I land. It doesn’t hurt at all. The sensation is not as it was. I have little feeling in part of my left foot. Wake up, I tell it. It doesn’t listen, but it does what it’s supposed to. It balances and rolls forward and I move along, right and then left. There is a rhythm I remember, an ease, a grace, that every athlete knows. I turn around just beyond the water tower (of course I took a photo so I could prove I came this far) and head in the direction from which I’ve come. Funny, they have separate lanes painted on the road now (this wasn’t there when we last came to Bethany beach but it’s been a while) – grass side for pedestrians, car side for wheels. On my return trip I see the people approaching me, walking, running and biking. As a walker, everyone went around me. But now I am jogging. I go around them. Some “real” joggers, runners even maybe, and cyclists pass as they head north. They raise a hand or nod in greeting. This is what we do, we athletes, we acknowledge other members of the club. I am one of the again. Twenty yards at a time, or until they are beyond me, I am one of them again. I can pass for a runner. Today, I walked the roads of Bethany Beach. It’s a place designed for pedestrian/bike activity. An outdoor play ground. I mean, it’s the beach. What better playmate can you have? There are paths on either side of the roadways that show bicycle directional travel. 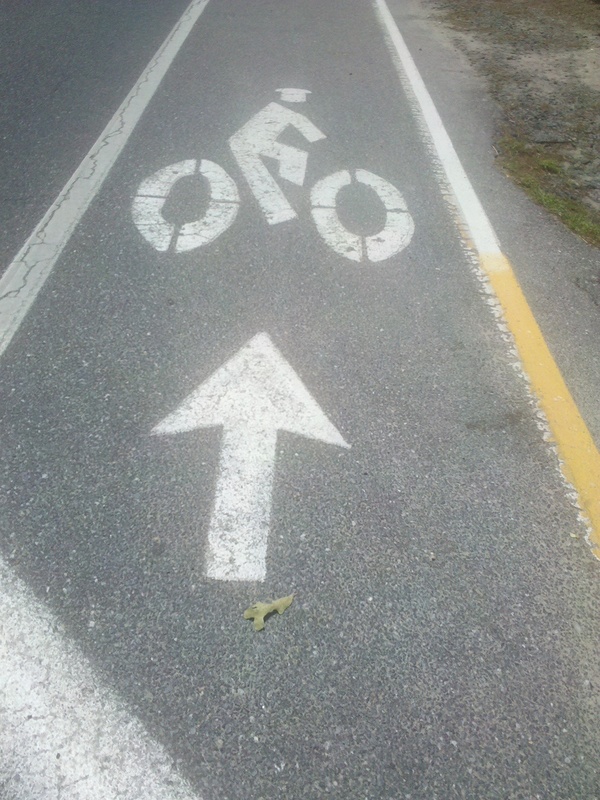 Of course, bicycles travel in either direction, regardless of the arrows. So do joggers, walkers, strollers. There are lots of rules on the beach and the boardwalk, but here on the roadway, pretty much anything goes. I don’t see anyone ahead so my walk turns into agility ladder play. A little side sliding, some quick stepping, some diagonal alternations. And then I think…I could just keep on stepping. Little steps. high knees. All the way to the stop sign. That would almost be like running. Like the old days. The good old days. And so I do. Anyone who saw me would think I just have an overly ambitious and bouncy stride. More upward, than forward. Kind of a waste of energy. This is okay. I don’t need to conserve energy. I’m not going very far. Just to the stop sign. Then I smile and congratulate myself. No one saw that right? I don’t have permission to “run” yet. But I can. So I do. And it doesn’t hurt. I am grateful. How incarnational this moment is, this feeling stronger, this balance, this stress and strain, this work of healing. Obedience in the daily diligence. I have partnered in the co-creation of a newly abled body. The diligence itself may have been prayer. If not prayer, then an offering and an answering grace. God becoming flesh in me. New flesh. Went to the Manchester United vs. FC Barcelona game at FedEx Field last night. Jodi, Olivia, Scot and I and 81,803 of our friends. It was a “friendly” with a couple yellow cards thrown in for good measure. Not all the starters, especially for Barcelona. No Messi. No Chicarito. No Pique (sp?). Rooney played, but only the first half and he was mostly just hanging out waiting for the team to send him a ball. We used my handicapped parking pass. Expires today. I don’t object. I am sub-par. Still no running. There will be no hurrying to the car post game to avoid the mass exodus. Impossible by my former standards. But when we’re injured, decline with age, or just are ‘dis-abled by weight gain’ …and are unable to do what we used to do…when does our parking pass expire? When do we arrive at our new normal? And who decides whether that’s handicapped? Is it…Relative to others? to my former self? Just need an assist because of my condition? By this standard, obese people would be (should be?) in all the handicapped spots. Geez – we’re a nation handicapped by our own distraction and temptation and indiscretion – to consume and settle. To take what we can when we can because we ‘deserve it’ and then suffer consequences we feel we don’t deserve. So, today is my last day of being “legally handicapped.” I don’t feel so. Agility ladder has me feeling like I could run, just a little bit. (small steps) Still, I am in PT. Should they discharge me? “Not until I am pain free and functional,” Mery says. I guess my functional goals are different from the regular joe. Running and plyometrics. Basic range of motion and strength, matching right and left, will not do it. I wonder how many 50 year old women DO the agility ladder? Tags: Handicapped, Soccer, Who is handicapped? I’m spending a bit of time in the orthopedist’s waiting room these days. Perhaps, actually, more in the PT waiting room – but that only comes in little blips. The orthopedist isn’t quite as good at keeping the waiting time down. That aside, waiting rooms are funny. Really, people in waiting rooms are funny. Some are engrossed in their smart phones. Some have a book. A few chat quietly with a companion. But the funniest ones are the ones there by themselves who have brought no other distraction. I guess I would fall into that category. Oh, I have my kindle but I leave it in my bag. I have more fun watching and listening to the singles in the waiting room. They are all experts on their own condition. Things settle back and the woman next to woman A, we’ll call her woman B, says to her, “I couldn’t help overhearing your conversation.” She proceeds, then to diagnose and recommend a doctor and treatment for woman A. This is fascinating to me. Complete with inaccuracies, mispronunciations and a plethora of completely unfounded conclusions, Woman B has managed to project her ailments on Woman A and, in the name of “helping her out” may have introduced a whole lot of new complications. True. Medicine is an art and not a science. But thank goodness the ones who practice the art have a whole lot of science behind them AND put due diligence into determining the details. Diagnosis without this is pure projection. I wonder how much we do this on a regular basis. I wonder how many people are eavesdropping on my conversations and shaking their heads. The oddest thing now about my recovery is the “motor sensation” or lack thereof. I rest my heels on top of the 65mm exercise ball and push up into a bridge. I see my heels pressing, but I only feel the strength of the hamstring contraction in my right leg. I know the left leg is contracting too and doing so equally to keep me in balance. But I can’t feel it. You don’t think of “feeling” a muscle, but the proprioception we get, the feedback about how strongly it is contracted, how much pull it is placing on the nearby joint, how its pull blends with other muscles being recruited is all information our cerebellum uses to determine how much activation is necessary. This is a continuous loop that coordinates our body’s movement, its force application, its bearing the load, its gracefulness. Oh, and along the way it lets the cerebrum know what its doing. That part seems to be missing at present. I tell it what to do and, in a semi-uncoordinated and slow to get to it teenager sort of way, it does just enough. If it’s too much it screams. But as long as its happy, it does it without bothering to share what its doing. Humble and shy. Understandable after all it’s been through. Just getting the job done. I will need that kinesthesis, though, to be smooth again. To “chunk” those movement patterns so I don’t have to think them all the way through. Pretty sure that’s coming. Eventually. Guess that’s why they call it functional training.